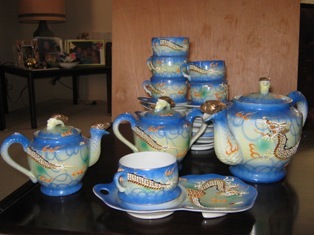 What to do with a Kure Japanese Tea Set brought home in 1946. 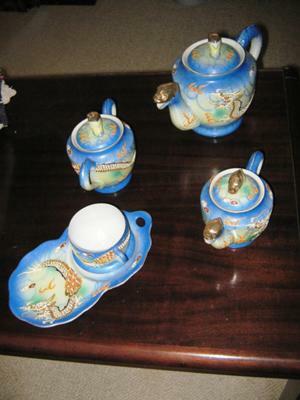 My father fought alongside the British Army in WWII and on his way home to Australia via Japan, at the beginning of the US Occupation there, he thought his mother would like an authentic Japanese tea set. So he bought the most garish one he could find … A 15 piece (6 combination cups and saucers) tea set bought in Kure, Japan in 1946. Now, having never used it, my mother would like to sell it. But who to and for how much please? I wrote earlier. My dad bought the same Japanese Tea Set. It is unique and in mint condition. but no other information. Susan, keep in touch! Your set is beautiful. I too have inherited the same Japanese Tea Set and it has never been used, great condition but I cannot find much information. Also, my dad bought an orange one for his mother. I cannot find it in any research so far. Both were purchased in about 1946 when Dad was in Japan. Air Force – Enlisted for the US. Army Air-Corp. Please keep me informed. I treasure the sets, but love to learn more. 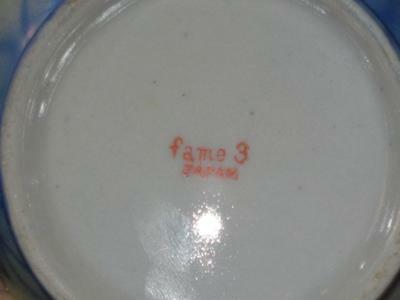 I sent my young wife home a dinner set from Sasebo in 1952, it was a very good brand at the time (Noritake). It is still on display in the lounge cabinet and has not been used. What funny people we are. Still it brings back a lot of thoughts and memories about the old times. I was on the HMAS Anzac at the time.